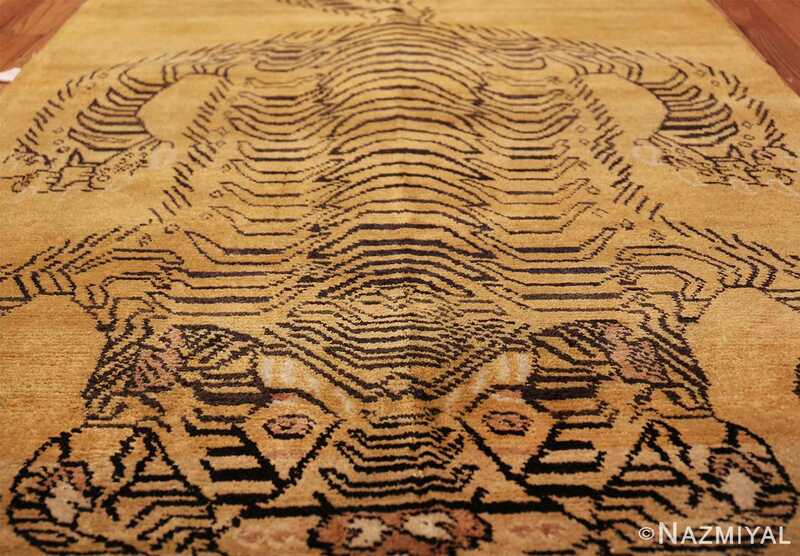 This truly breathtaking vintage Tiger design Chinese carpet contains all the beauty, fascination, and power of Oriental artistry. 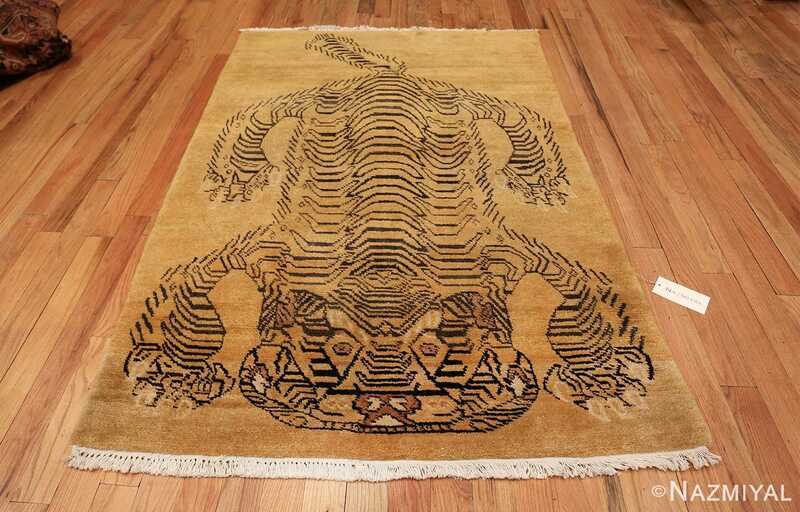 The skillful outline charcoal colored strokes are what form the body of this, at times, ferocious animal. 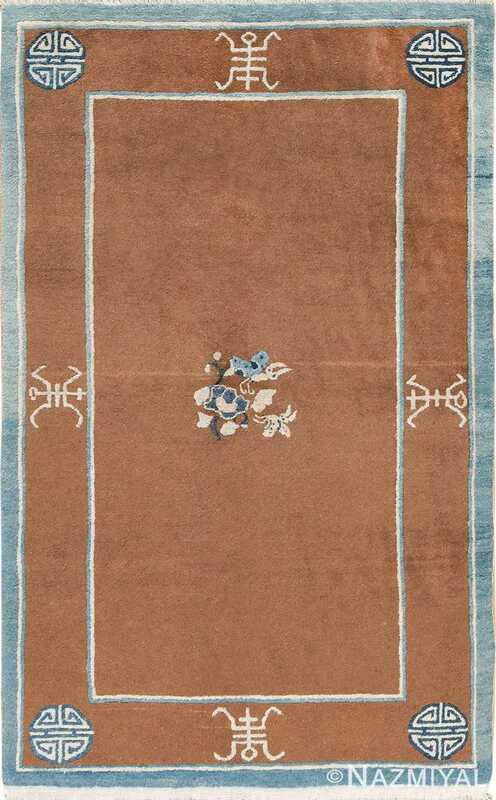 In addition, the exquisite subtle white outlined claws and mauve colored details, fuse with the rich, warm sandy colors background. This combination of the outlined design against the background of the vintage rug itself create a masterpiece that is simply glowing and alluring. This brilliant animal rug emanates a powerful and vivid gleam of Oriental pride that glows with wonder and a modern contemporary style. 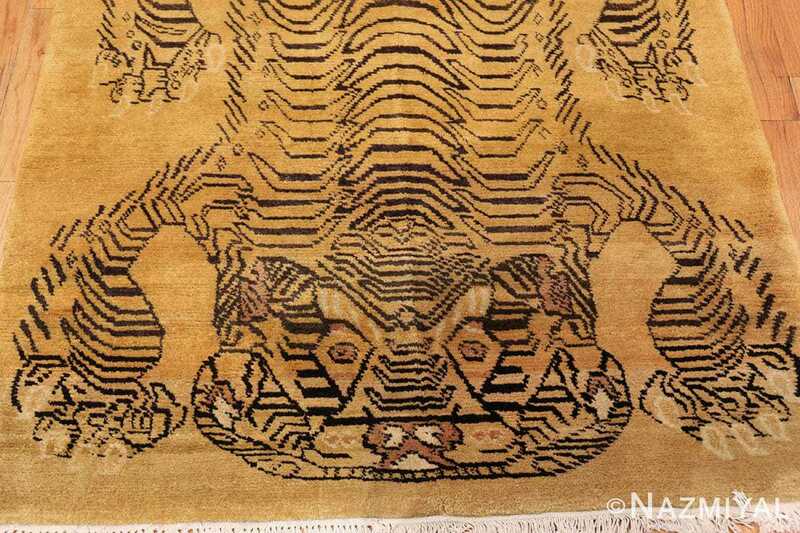 The remarkable precision that characterizes the illustration of the tiger’s body is the most prominent visual force in this carpet. Upon first glance, this vintage mid century Chinese tiger rug produces a powerful artistic impact that excites the imagination in just fractions of a second. All four paws are outspread as if they are ready to pounce. The eyes of this wild mammal are accentuated by the diamond outlined design in which they are placed. These two mauve colored eyes seem to stare upwards straight at us, as though the tiger is staring right into the depths of our soul. The tail of this magnificent tiger is tapered off to the right. This little offset of the symmetry, shows just how much skill and foresight the artist who created it had. 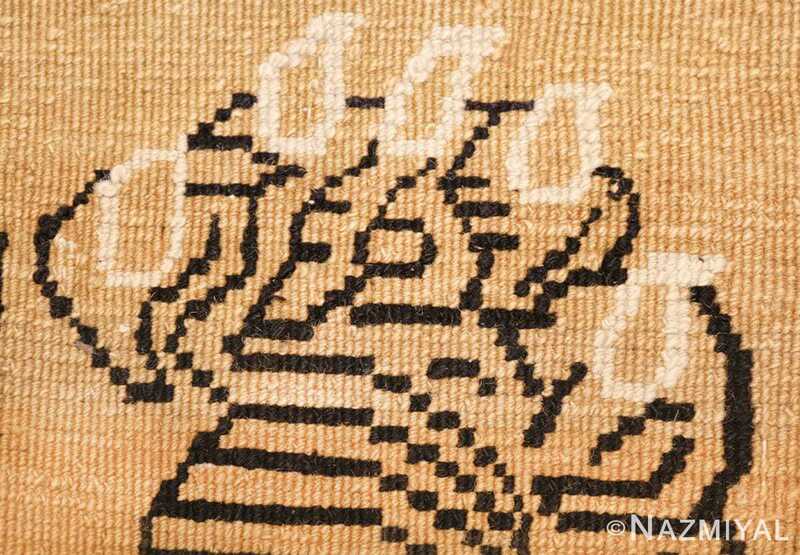 The weaver was not interested in creating perfect mirrored symmetry. 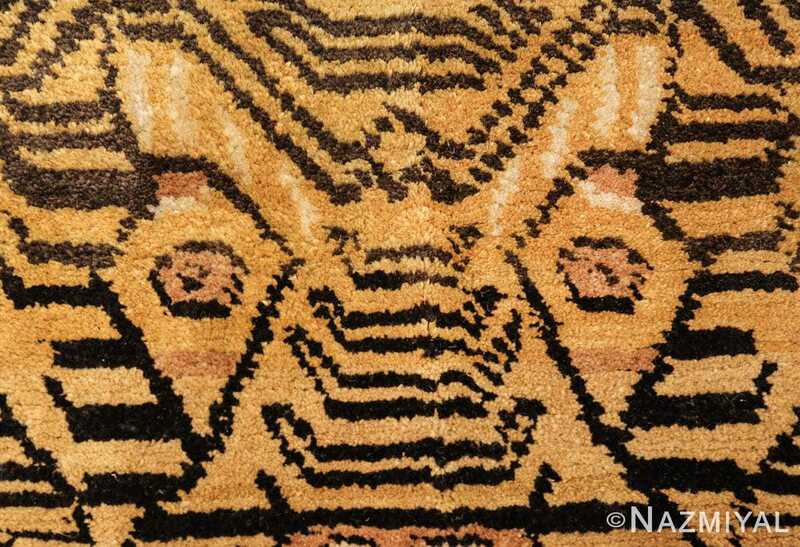 He or she was far more keen on focusing on the artistic impact than merely creating a symmetrical area rug for someone to walk on. 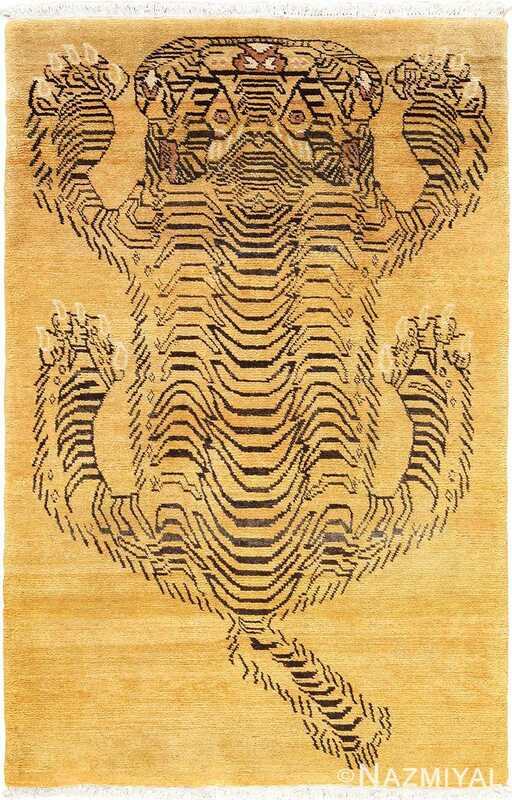 The stark simplicity and limited color pallet that characterizes the color play in this tiger rug gives it a modern vibe. That said, it contains details and clues that hint at a more surreal and primeval past. 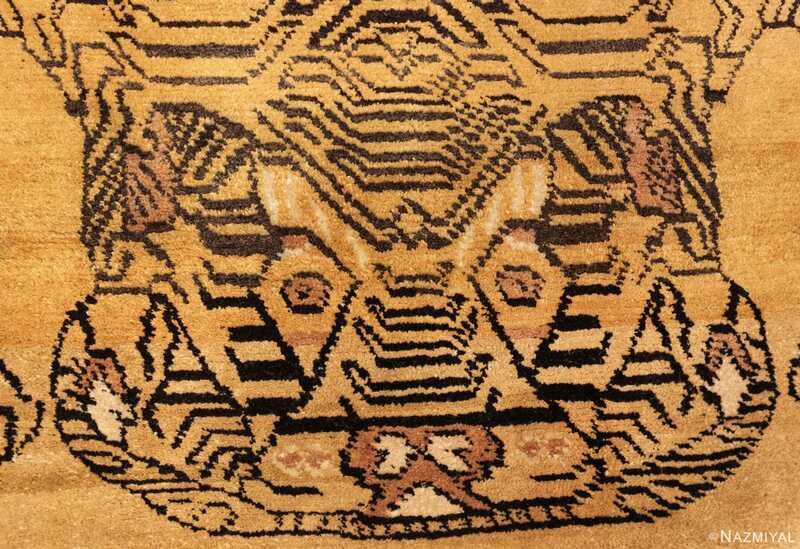 The stony glare of the tiger, the detailed sketch of its body and the symmetry of its outspread paws paint a picture of tribal wonder. This truly brilliant artistic masterpiece exudes both a vintage and modern charm. The tension and dichotomy that this vintage mid century Chinese tiger rug creates between old and modern and tribal and elegant, produces a work of textile art that is sure to inspire generations to come. 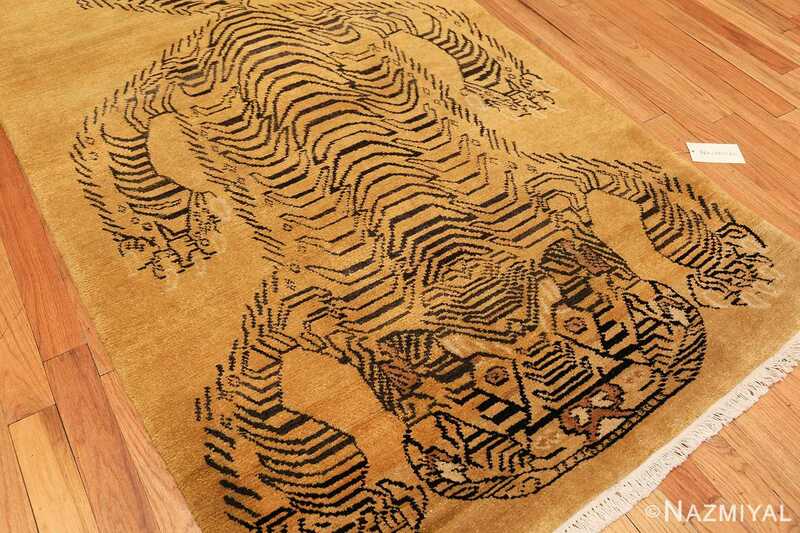 This is one Chinese tiger rug that would be a joy to live with. 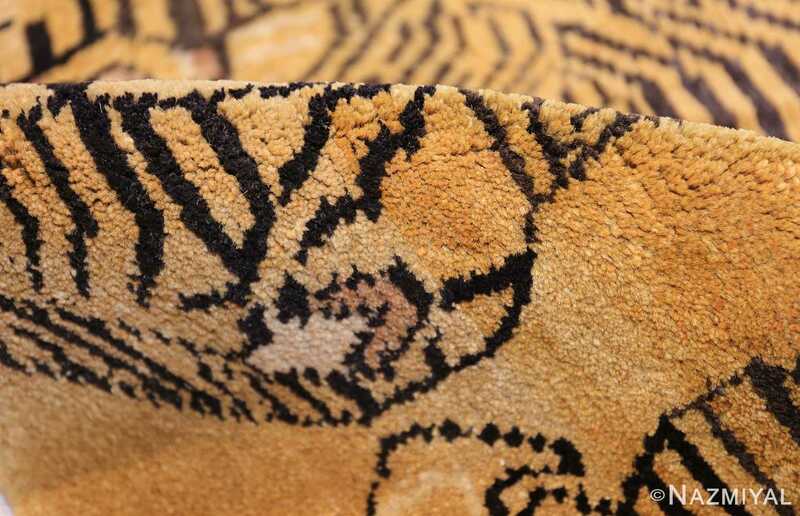 Without a doubt it is sure to enhance any interior design approach and aesthetic. 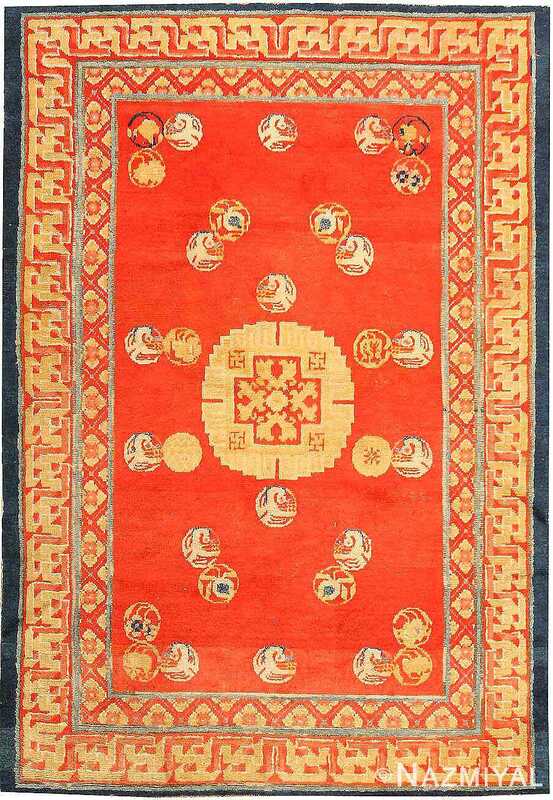 Exemplifying eastern design traditions, this 19th century carpet from Ningshia features a dimensional pinyin wan border and a bold red field decorated with sparse roundels and a traditional medallion. 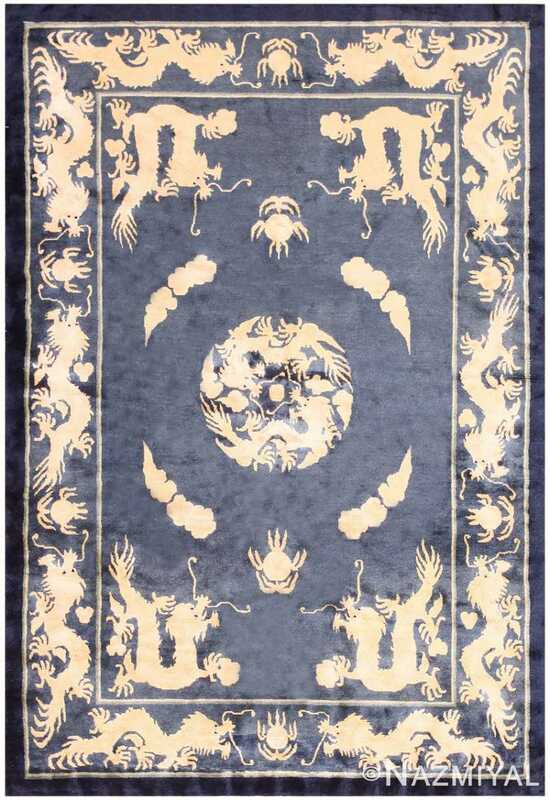 Featuring a classical Chinese pallet of ivory blue, this beautifully designed rug is notable for its menagerie of dragons, which appear throughout the entire composition.